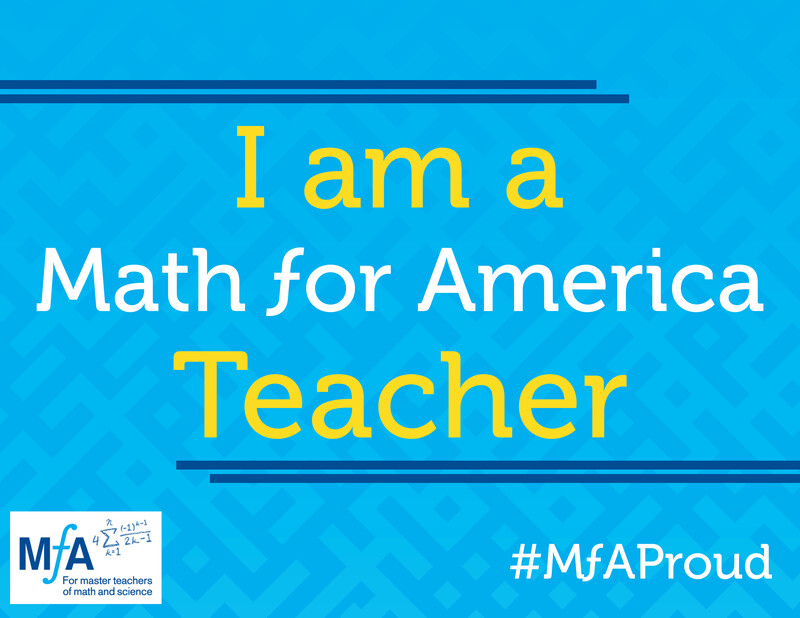 This was cross-posted in the Math for America Teacher Voices blog today (along with the headshot!). Joining the online community of mathematics educators has had an indelible impact on my professional development. Through blogging, I explore and reflect on my teaching practice, as well as contribute resources to a vast network of similarly inclined teachers. By writing honestly, I expose myself not only to critique, but also to support. And by raising my voice in response to inequities and injustice in education, I am stepping out of my classroom and comfort zone to engage in debate. The greater the number of teachers who challenge themselves to blog, the more vibrant the online community becomes, thus elevating the profession; consider taking this creative step to develop yourself. The first teacher blog I ever read was Math Teacher Mambo by Shireen Dadmehr. As an early career teacher in a high need school, I was continually searching for high quality materials to engage students for whom math was at best a tolerated chore, and at worst, a subject to be avoided. That Shireen had a widget on her blog, which linked to all of her worksheets, freely available for borrowing, was a game changer for me. I visited her site regularly, downloading her content for current and future use. Shortly thereafter, I came across Dan Meyer’s blog, and realized that the world of math education blogging was huge. Reading through comments on any of Dan’s posts, and clicking on the links therein, led me down a fascinating rabbit hole of blogs containing resources, reflections, policy debates, and humor. I created my first blog, Math on the Blogosphere, in 2009. A combination of classroom reflection and student outreach, I envisioned my students checking my updates and following intriguing instructions nightly. Not successful in engaging them, I posted irregularly for a year or two, and stopped writing. My blog reading, however, continued, and in 2013, I began writing anew at Her Mathness. My goal was no longer garnering student readership, but rather participating in and giving back to the online community – sharing resources, and having a voice in continually evolving conversation about math education. A long time ago, I earned a couple of degrees in English, and the opportunity to exercise my writing muscles was welcome. In 2013, I attended my first weeklong residential conference at Exeter and wrote a lengthy post about the classes, participants, and inspiring keynote speakers. One of these speakers was Dan Meyer, who noted my recaps in a post of his, and I was on the map (485 hits in one day!). I also attended Twitter Math Camp that summer, and my commitment to blogging was permanently cemented. The community of math teachers who regularly share, reflect, and thoughtfully converse about their teaching experiences became real, welcoming, and inspiring. I wrote more regularly, and ran a pictorial daily 180 blog for one year. I shared resources I developed, reflected publicly on my teaching – its weaknesses and strengths, wrote about injustices and frustrations, and shared personal posts. My blog became my online professional journal; the process of writing each post gave me the mental space to contemplate my classroom practice and my students’ concomitant participation. I now attend to the appearance as well as the writing of my blog, posting photographs, images and videos to enhance the content. And I always cite my sources and inspirations. Diving into the math education corner of the internet is a rewarding and broadening experience which connects me with a diverse group of like-minded professionals, who prioritize student learning through open reflection – the MTBoS (Math Twitter Blogosphere) is my professional learning community. Writing a blog is not without risk; the memory of the Internet is infinite, as is one’s exposure. This exposure forces me to be thoughtful, intentional, and as clear as possible when expressing opinions, or citing someone else’s. Last May, I wrote a post about the ‘Course Corrections’ event at Momath – a conversation between James Tanton and Andrew Hacker about who needs what type of math education. I was keenly aware that I was attributing words to the speakers based on a fallible recording (my handwritten notes). I issued disclaimers when I wasn’t entirely certain that quotes were accurate, and checked with others who had been at the event. My caution paid off, and the post was well received and heavily commented upon. In fact, four other Math for America teachers (James Cleveland, Amy Hogan, Patrick Honner, and Jose Vilson) have blogged about Andrew Hacker as well – each eloquently expressing their reaction to a perceived attack on math education. MƒA Master Teacher Evanthia Basias has just started her blog, Fun with Geogebra, which promises to be filled with tips for using Geogebra, Desmos, and other dynamic resources in the math classroom. MƒA Master Teacher James Cleveland, in addition to writing reflectively about his classroom, conferences he’s attended, and LGBTQ issues in the classroom, shares instructions, resources and classroom action tips for using games to teach and practice math over at The Roots of the Equation. At A World of Science, you can find detailed project-based curriculum guides, and technology-based how-to videos; additionally, MƒA Master Teacher John Derian also shares auxiliary documents he has created. Steve Gallagher, an MƒA Master Teacher, has generously shared an entire course in Forensic Science over at Crime Scene, complete with lesson plans, photos, worksheets, and relevant links, available to anyone who stops by his website. If you teach AP Statistics (or Algebra 2, or any math, for that matter), A Little Stats is a must-follow blog; Amy Hogan, an MƒA Master Teacher, shares thoughtful activities, data and technology sources, and detailed statistically related recommendations. Not limiting her writing to Statistics resources, Amy’s reaction to Andrew Hacker covered three posts. Over at com, the mission is “to organize the world of Education, Science and Technology to improve lives!” Towards that end, MƒA Master Teacher Parvez Jamal provides links to articles, videos, and tools; there is something for everyone at his website. At MƒA Master Teacher Michael Zitolo’s wikispaces website, SOF Physics!, you can find physics, programming, and Arduino resources (including his tutorials). MƒA Fellow Matt Baker, writing at Pythagoras Was a Nerd, questions his teaching and classroom persona publicly, sharing ideas and (bravely) soliciting feedback. He writes about his professional goals before the school year begins, reports on how well he did afterwards, and looks constructively forward, modeling truly reflective practice. It is clear that Kit Golan, an MƒA Master Teacher, uses his blog, Those Who Teach Do More, as a space in which to think through some of the issues we all face – covering depth versus breadth, how to best start the school year, accountable talk in classrooms – as well as to share his personal growth as teacher. Another blog that includes reflection – on classroom practice, relationships with students, graduate school, Pokémon Go and education – is Carl’s Teaching Blog, written by MƒA School Leader Fellow Carl Oliver. Lazy Ocho, MƒA Master Teacher Brian Palacios’s blog, contains in-depth reflections on teaching, professional development, and education policy. Lazy Ocho also has a comprehensive page of online math education resources, categorized by both course and classroom use – thanks for doing the legwork for us! Howard Stern, an MƒA Master Teacher, reflects on teaching, professional development, technology and school politics at mathmtcs. His recaps of George Hart’s Geometric Constructions workshops include both experiences at MƒA and school. MƒA Master Teacher Brian Cohen’s blog, under the Making the Grade Blog tab at com, primarily addresses both local and national education policy issues. Math teacher, photographer and New York Times contributor, MƒA Master Teacher Patrick Honner shares his teaching reflections, mathematical photography, and policy opinions at Honner. His website is well organized, with links to a great collection of resources. John McCrann, an MƒA Master Teacher, has a spot on Education Week’s Teacher Blogs page. His blog, Prove It! addresses a wide range of topics including experiential education, opting out, race, and privilege and assessment. Author of This is Not a Test and founder of #educolor, MƒA Master Teacher Jose Vilson writes over at JLV. His posts are about race, class, and education; they are thought provoking, and full of relevant references. Jose also has guest writers presenting additional perspectives. Wendy Menard, blogging at Her Mathness, teaches math at Midwood High School at Brooklyn College, where she has been the math department technology coordinator and coach of the math club. She left a career in budgeting and finance to become a math teacher in 2006, inspired by the public school teachers she encountered through her children’s education. Wendy became an MƒA Master Teacher in 2015, and will be co-facilitating the Racially Relevant Pedagogy PLT with Jose Vilson this fall.